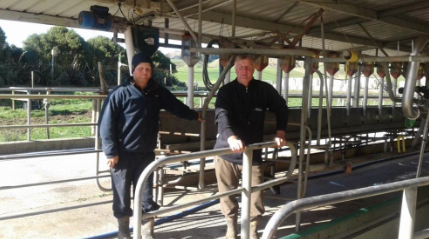 “Using the tracesure® mineral bolus made our life a whole lot easier” says Te Uku farmer Grant Dickey. We saw the tracesure® mineral bolus that offered a 5-6 month slow release of selenium, cobalt and iodine so we thought – let’s give it a go – what do we have to lose? My farming system is rearing and finishing Friesian bulls. To optimise returns they must be at a killable weight at 18-29 months. I farm in the Maniototo which has a healthy but challenging farming environment. My belief is that nothing or no one performs to their full potential while under stress. What a great product you have developed. My young bulls have always tracked along ok, but as I run them quite intensively there can be high larval challenges at times. If I am day or two late with a drench it can have quite an impact on their growth rates. After consultation with Adrian Campbell and Ivan Holloway, our vets from Vetlife, we came to the conclusion there was still room for improvement and we had the ability to increase growth rates through the summer, autumn, and winter period significantly. Alpheus capsules have enabled me to avoid worms, therefore yarding and drenching, from early February (all stressful, time consuming activities with a health and safety risk) with no signs of a follow up drench being required at this stage (December). They have never looked back. We achieved great growth rates (average between 900 to 1000gms growth rate per day over winter), well above anything I have achieved before. It is the second year I have wintered on fodder beet and no other management changes were made so I can confidently attribute their great growth rates to the Alpheus capsule. We will definitely be using them again next year. With good stock handling/restraining facilities application is a breeze!